Nine National Federations have released a strongly-worded statement in which they claim the stance adopted by EuroLeague Commercial Assets’ (ECA’s), the company who operate the competition, "threatens their existence and jeopardises their qualification chances to the FIBA Basketball World Cup and Olympic Games". The row has plunged European basketball into crisis, with both bodies remaining at loggerheads since the EuroLeague confirmed that its competition calendar for the next season will not feature dedicated windows for international games in November 2017 and February 2018. FIBA lashed out at what they saw as a "heavy-handed diversionary tactic" when they rejected a EuroLeague proposal for a 38-week club schedule running from October to June, with a six-week window for national team competitions in June and July and a complete break in August. 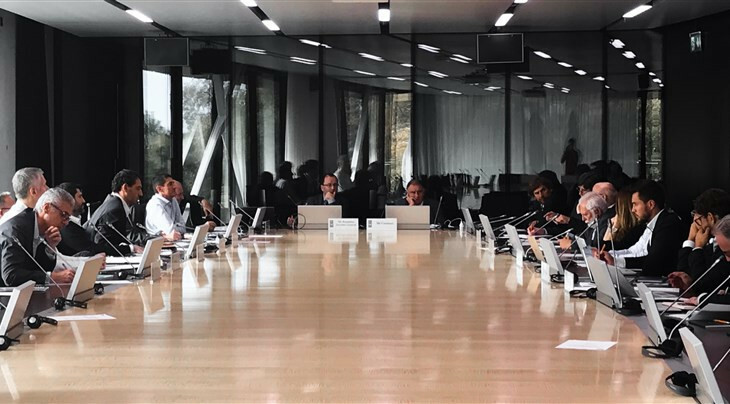 FIBA’s National Federations which have clubs participating EuroLeague - Germany, Greece, Israel, Italy, Lithuania, Russia, Serbia, Spain and Turkey - met at the House of Basketball near Geneva in Switzerland to discuss issues relating to the FIBA Basketball World Cup 2019 Qualifiers. Their statement read: "We condemn EuroLeague Commercial Assets’ refusal to change two game-days as a commercially-driven attack to the national teams, which endangers their existence and jeopardises their qualification chances to the FIBA Basketball World Cup and Olympic Games. "The national teams remain the locomotives of basketball worldwide." The decision of the ECA not to include dedicated international windows means, as it stands, that players will, therefore, not be automatically released to represent their countries in the 2017-2018 cycle - the first in FIBA's revamped calendar. The joint statement from the nine countries called for unity and again pressed for a change in the club calendar. "The basketball family needs to stay united and work together in solidarity for the joint goal: promoting the sport of basketball," the statement said. "Clubs and national team competitions can co-exist throughout the year, as it happened until 2003 in basketball and is currently the case in other team sports. "We acknowledge ECA’s written confirmation to the European Commission that, 'A club would certainly not be in breach if it did not field certain players because they are away with national teams in compliance with their regulatory duty under the relevant FIBA’s or national federation’s rules' and urge ECA to respect its own commitment from November 2016, by amending the EuroLeague calendar which creates an evident obstacle in the release of players. "We remind the clubs participating in our national championships that they have rights as much as they have obligations. We condemn any direct or indirect pressures from clubs on players. "We will continue to provide the best possible conditions for the national team players." The statement added that a 10th national body, the French Federation, "also fully supports the solidarity expressed and endorses the above statement".